Old Town is the first site in California settled by Europeans. It was the center of San Diego until the 1860s, before downtown was developed. Old Town went into a century of decline until 1969, when the city’s bicentennial celebrations restored focus to the area. Now, the neighborhood is a popular destination for tourists, shoppers and diners. It also has about a dozen art galleries, nine hotels and several museums. It comprises 230 acres and is bordered by Mission Hills to the east, Bankers Hill to the south, Interstate 5 to the west and Interstate 8 to the north. 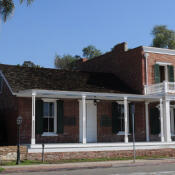 Old Town San Diego State Historic Park comprises five original adobes restored to how they would have looked in the 1800s, as well as shops, restaurants and museums. Business in Old Town centers on tourism and the area’s historic heritage. The neighborhood has nine hotels, 32 restaurants and more than 100 specialty shops. Fiesta de Reyes is the main shopping complex, in Old Town Historic State Park. A blacksmith, newspaper office, stable, cigar and pipe store, schoolhouse and woodworking shop offer glimpses of early industry and life in the area. Due to its historical Mexican flair, Old Town’s shops are one-of-a-kind, including Toby's Candle Shop, Captain Fitch’s Mercantile and Covered Wagon, which sells Indian jewelry and Western wear.